We want to offer horse people SOLUTIONS to everyday equine needs - join our Business Directory now! We welcome your participation. Go to "Membership" to pay online. Our High Country Wilderness awaits you! 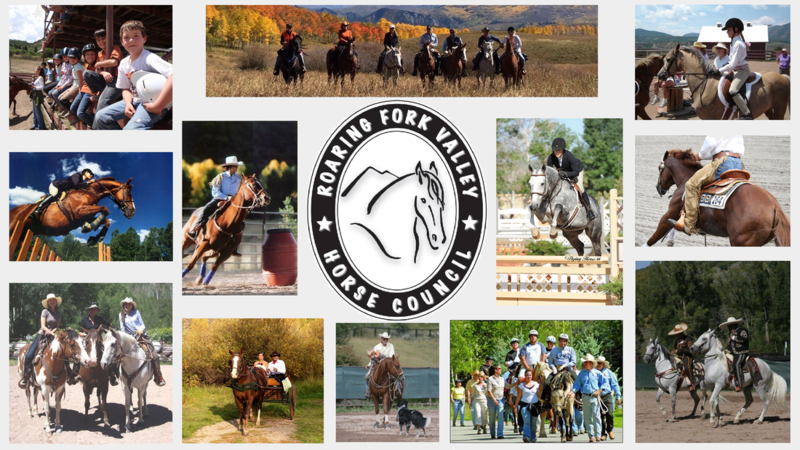 The Roaring Fork Valley Horse Council (RFVHC), represents many people who are involved with and in support of the horse industry in the Roaring Fork Valley. They are ranch owners, professional horse trainers, stable owners & managers, amateur horse owners, veterinarians, therapeutic horse program administrators and their clients, and members of the various equestrian associations including RFH Pony Club, CWHJA, NRCHA, NCHA, NRHA, AQHA, PRCA, USDF, USEA, & USEF, (all of which represent both Western and English equestrian disciplines).